We're still cooling off and wringing out after one of our warmest and wettest Aprils on record. Click any underlined heading in the graphic to read more about that topic, or scroll down to read our full climate summary. Warm, humid air in place for much of the month made for our warmest April on record out of the past 123 years, narrowly edging April 2002 by 0.04°F for the top spot. The statewide average temperature of 62.67°F was about 4.5 degrees above the 1981-2010 average, and about the same amount warmer than our more seasonable April last year. Driven by well above-normal high and low temperatures, many stations recorded their warmest April on record. That includes Hatteras' warmest April in the past 122 years, Charlotte's warmest in the past 138 years, and the warmest in Wilmington in the past 144 years. Several good rains have pastures greening up and beginning to improve. There appears to be some moderate to severe wheat damage, especially in early planted fields, because of the freeze. There was some damage to strawberries, but most producers seemed come through okay with the use of row covers. Those high rankings are even more notable when you consider that the month didn't start out with particularly warm weather. On April 7, low temperatures dropped into the 30s, reaching at or below freezing in many areas. According to the USDA's mid-month Weather and Crops Report, that damaged about 43% of winter wheat crops around the state. However, the damage could've been worse if the freezing temperatures had lasted longer. After that final flirtation with winter, spring arrived with at least a dozen days with temperatures at or above 80°F across much of the Piedmont and Coastal Plain. The 13 such days in Greensboro and 16 such days in Raleigh were the most on record for April at each site. The month also finished with the first 90 degree day of the year in Fayetteville. At that location, the average first 90°F day is May 3, so this year's first occurrence on April 29 didn't come too much earlier than normal. It is a good reminder, though, that those warm days will become more common in the next month or two. While the warmth was impressive, the weather story of the month was the relentless three-day rain event from April 23 through 25. Totals from the event ranged from 1.75 inches in Elizabeth City to 7.75 inches -- more than two months' worth of rainfall -- at the Raleigh-Durham Airport. Some CoCoRaHS observers in Wake County received even more than that, reporting more than 9 inches of total precipitation! This event was caused by a combination of ingredients converging over North Carolina. An upper-level low pressure system moved in from the west, eventually becoming cut off from the jet stream flow that usually moves these systems along. That meant it took its sweet time crossing the Southeast. At the same time, a surface low developed to our southwest and as it slowly moved eastward, it vaulted Gulf and Atlantic moisture inland like a firehose across North Carolina. By the 24th, that low was sitting nearly stationary over South Carolina, so the areas receiving rain got plenty of it in a short time. The Raleigh-Durham Airport received 29 consecutive hours with measurable precipitation beginning on the 24th at 6 am. At that site, that's the second-longest such streak on record, trailing only a period of 41 straight hours of measurable rainfall when Hurricane Dennis made landfall in September 1999. Eventually, the upper-level low was re-absorbed by the broader flow and the surface low pushed offshore as well, which made that rain, rain finally go away. At that point, though, the excess water was in the rivers instead of the sky. Along the Tar and Neuse rivers, which had the most upstream rainfall, sites reached Moderate to Major flood stage as the water worked its way downstream. 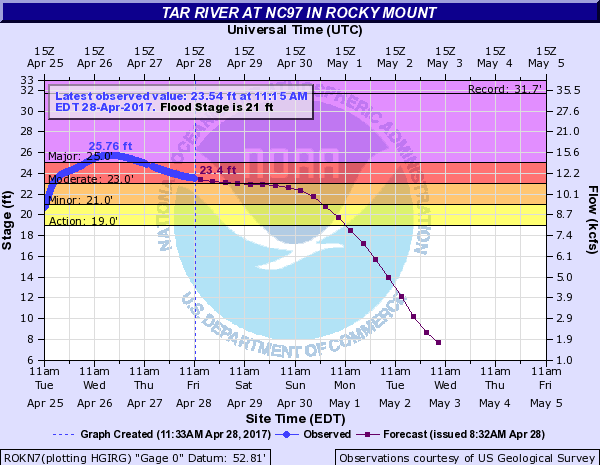 The Tar River at Rocky Mount reached 25.76 feet, which was its 4th-highest crest on record behind those following Hurricane Floyd (31.66 feet), Hurricane Matthew (28.73 feet), and Hurricane Fran (25.88 feet). Mostly because of the heavy rain from that event, April ranked as our 2nd-wettest on record with a statewide average precipitation of 7.04 inches. That came up just short of the 7.18 inches from April 1895 -- the first year of widely available modern records. Aside from the northeastern coast, which had near-normal precipitation, the rest of the state was much wetter than normal. As the focal point for the heaviest rainfall, Raleigh finished with 8.66 inches of rain and its wettest April on record. Elsewhere, the 7.65 inches in Asheville ranked as the 2nd-wettest April in the past 126 years, and one of the state's traditional wettest locales in Brevard had its 7th-wettest April in the past 82 years with a monthly total of 9.08 inches. Those rains in the western part of the state led to widespread reductions in the drought. Entering April, half of the southern Mountains was classified in Severe Drought (D2) by the US Drought Monitor. Now, only a small part of Clay County remains in D2. The Moderate Drought (D1) conditions that covered the northern Mountains and Piedmont were also washed away, with that region now either classified as Abnormally Dry (D0) or not classified at all by the Drought Monitor. US Drought Monitor maps for North Carolina on March 28 (left) and April 25 (right). Because of 5.5 inches of rain this month, conditions are about normal on our farm. We had a few days of dry weather last week but .24 inches last night. Creek and spring water levels are at normal levels. We've been planting new seedlings and transplants and the soil has adequate moisture levels. Recent rains have made plants and trees pop and the Cane River, just down the road, looks like a river again. After getting over 3 inches of rain in the last week, all of our creeks are flowing audibly. When I was working in the garden two days ago, I heard a noise I could not identify. Following the sound, I realized it was water flowing over rocks in a creek. It had been so long I had forgotten the sound! The outlook also looks favorable for regular rainfall continuing. NOAA's Climate Prediction Center shows that above-normal precipitation is likely across much of the Carolinas in May. The longer-term outlook continues to show warm conditions for much of the country, so we may be getting an early start to sticky summer weather.